Previously an empire, China can be defined through her long history, structured internal cohesion, set of defining organisational and philosophical paradigms, established relationships with its neighbouring states, as well as by her distinct family of languages. These traits are, in turn, vastly influent throughout East and South East Asia, in particular through the Chinese written script. A specific feature of the Anthropology of China is the way in which the power of the Chinese state inevitably shapes the work of anthropologists. While anthropologists of other cultural regions, especially previously colonised ones, have often been able to carry out research with a high degree of autonomy from the local powers, the Chinese state is not avoidable in similar ways. Anthropologists of China constantly have to deal with state power, with its capacity to pose limits to our research, and also with its strong claim to control what is said concerning itself. This dimension has at least one important theoretical consequence: anthropologists of China often allow the Chinese state a central position in their research. 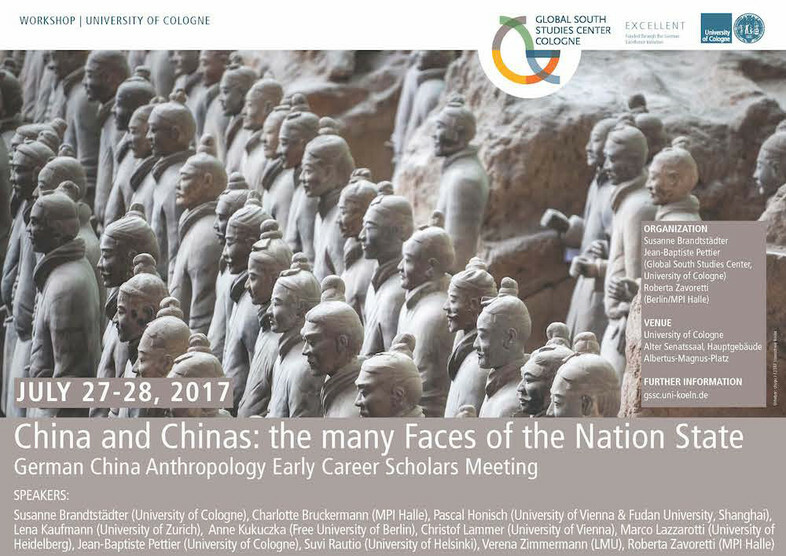 This German China Anthropology meeting will directly follow the conference 'The Enigma of Change and Continuity in China', to be held in Köln on July 24-26th. In order to further explore the two complementary sides of China as highlighted by the conference, we intend to dedicate our workshop to the "discontinuities" of China, the challenges to her unity, her peripheries, and to the confrontation between centrifugal and centripetal forces behind her unity. To reach this aim, we propose to look at the ways in which the diversity of China emerges from our ongoing research projects. In particular, two opposed dimensions seem of particular interest. The first one consists in how 'the centre/the state' itself deals with the fragmented character of 'China', in particular by framing it in its own vocabulary and norms. This happens for example through the construction of a defined number of 'nationalities', the allocation of official 'autonomous' status to peripheral and border regions, the strong affirmation of territorial claims (Taiwan, southern China sea, Xinjiang, Tibet...), or the state-led production of specific population categories through, for example, the differential distributions of rights and duties (birth control, hukou regulations...). The second one consists instead in the way the peripheries deal with the centre, by acting within its frames or otherwise avoiding, ignoring, or confronting them. By giving voice to the centrifugal and centripetal forces binding China together, we intend to deepen our understanding of China’s complexity, and highlight the contribution that the study of China's unity and diversity can bring to anthropology. This meeting will explore the diversity of China, in order to better understand the forces tying these fragments together.